Keeping Up With the Kapenga's: Oh BABY!!! Dave and I are so excited to announce to anyone who doesn't know yet that WE ARE EXPECTING! We are very excited and eagerly anticipate the arrival of little baby Kapenga. My due date is August 28 but since I was late with Jenna I won't hold my breathe and I'll plan on a September baby. I'm a day shy of 10 weeks and while I am overjoyed to be pregnant I will be much more comfortable once I'm beyond the "sickness" portion of pregnancy. I was sick with Jenna but this little one has caused more constant nauseousness, especially during the evening and throughout the night which has not been so much fun and it started way earlier in the pregnancy than with Jenna. The last 4 days have consistently been a little better so I hope the trend continues! 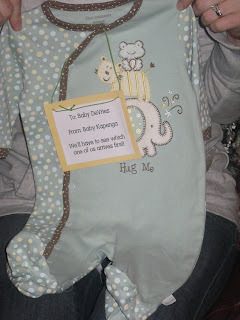 the attached tag read "To Baby DeVries, From: Baby Kapenga." She got it right away and was surprised to find out that we are actually due before them by 10 days or so. She was early with Evan and I was late with Jenna so maybe these newest additions will share a birthday. We had told my mom a couple weeks ago while out to dinner and last Wednesday when we were all at her house for dinner (it's kind of become a tradition to go to mom's for dinner on Wednesday night...gives her a chance to cook a big meal), she opened with prayer. At the end of the prayer she thanked God for blessing Dave and I with this new little miracle. Everyone was listening because when all eyes opened everyone had that "did I just hear that correctly" look on their face. Jenna is slowly catching on and getting excited. The first few times we mentioned it to her she simply stated she didn't want a brother or sister. Sunday night we explained more thoroughly that there is a baby growing in mommies tummy and that she's going to be a big sister. Her reply was simply " I don't want a baby brother or baby sister". I'd reply with how much fun it would be and ask why she didn't want one. Her response, "I have Allee" (her cousin). I think it's more about Allee not living here and the idea that she gets to see Allee and then gets to come home and be spoiled all by herself. By Monday morning she had a change of heart. We asked her again and she giggled and asked "there's really a baby growing in your tummy?". Now she sits on my lap, laughs and says "I'm sitting on my brother and sister"....yes, you read that right too, she wants one of each! I told her only one at a time. With 30 weeks to go I'm sure there will be plenty of pregnancy posts. Yeah, Yeah, Yeah!!! We are so happy for all of you and pray that the next 30 weeks go by smooth and that you have a healthy pregnancy! Congrats!!! I was so excited to read your blog Wendie!! Congrats girlie!! I hope you start feeling better soon - I know how hard it is when you feel so yucky :) We will pray that this little one grows healthy and strong...congrats!! Congrats!! When I saw you in church sunday you looked extra happy... now I know why. I kept asking Briana if you and Dave were expecting yet, and today she called me and told me. So very happy for the both of you. yeah! Congrats!! I was super sick with Neal so maybe this one is a boy!! Congrats again! I am so glad I get to tell people now! Congrats again! I love it that our bellies will be big together! Christmas is going to be CRAZY! I read on Megans blog you guys are expecting. I just wanted to drop by and say congratulations! Congrats! I can't believe I missed this post. I just read Megan's. So happy for you guys.